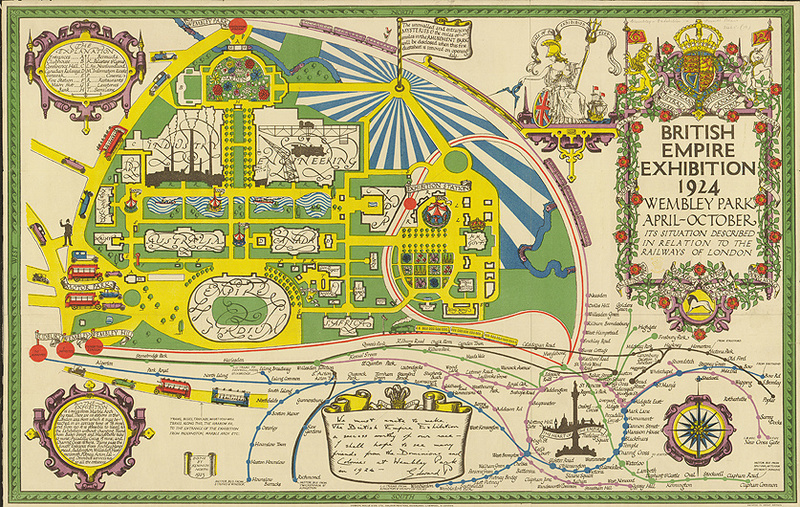 This colourful, much adorned map was produced as a fold-out poster on the back of the official guide for the British Empire Exhibition which took place in Wembley Park in 1924-5. The “Empire Stadium” that features on the map later became Wembley Stadium, famous for its twin towers, which survived until it was demolished and rebuilt in 2003. The map was created by Kennedy North in 1923. The flowery writing and decorative style reminds me of the maps of MacDonald Gill, the latter’s cartography of London was beautiful to look at, if time-consuming to plan journeys with. 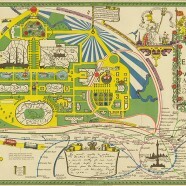 The simplicity of the famous Beck tube map was ten years away from time of the exhibition. 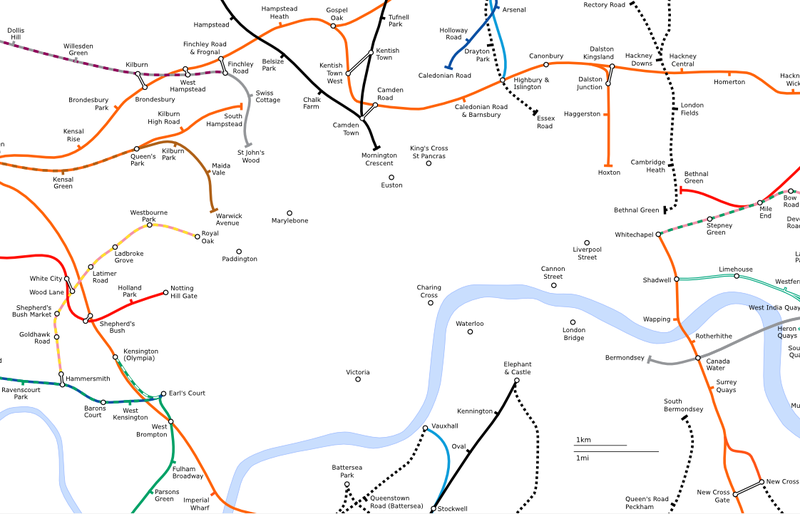 Of particular interest is the tube/rail map section, at it shows the Circle Line (or, at least, the two lines that formed it then) as a perfect circle. Indeed the whole map uses curves of varying radii to convey the network in a simpler way than the geographic reality. 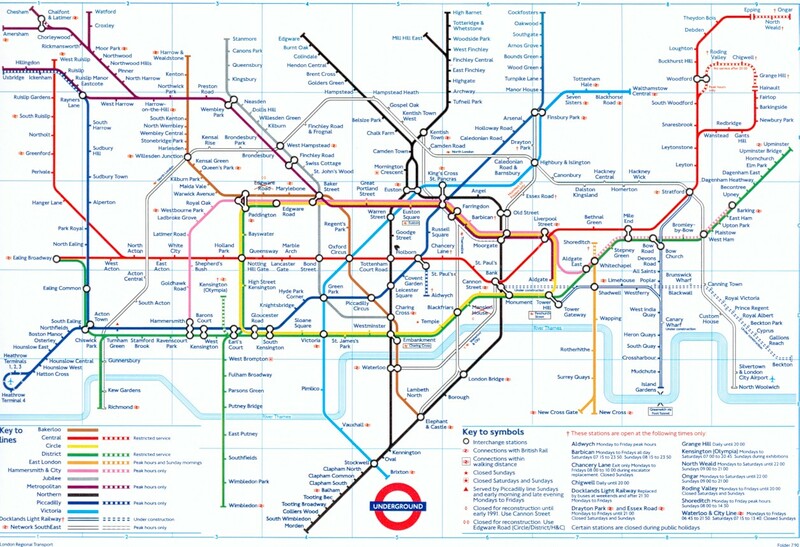 The style reminds me of the more recent curvy tube map by Maxwell Roberts and indeed my own Electric Tube map which also shows the circle line as a circle. In the British Empire Exhibition map, the northwestern part of the tube map is massively engorged, to show the layout of the exhibition itself, here switching to a geographical map, with the five nearest tube/railway stations highlighted as red blobs. The tube line colours are somewhat different to the modern ones: Green is the Bakerloo and Northern Lines, Red shows the mainlines from Marylebone. The District and Piccadilly lines are Blue, and the Hammersmith & City, Metropolitan/Jubilee, West and East London Lines are Purple. Black is the Overground network. 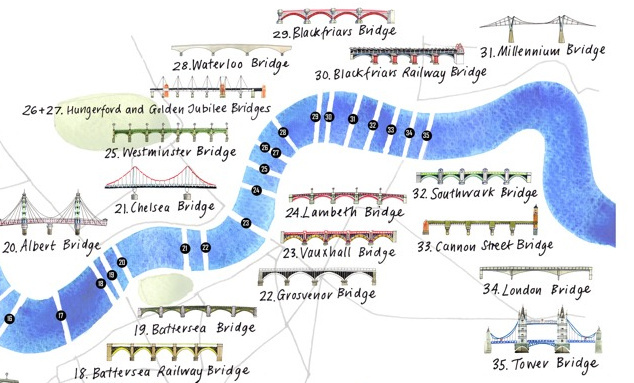 The adornments on the map are most impressive in their number and content. For example, one in the bottom left corner has tube statistics as prose. It mentions that there are 126 stations in “the London area” and that from 120 of these, it is possible to reach the Exhibition without changing trains. There is also a signed message from King Edward V, and a full royal standard, which shows Newfoundland as a separate territory, as it was back then. 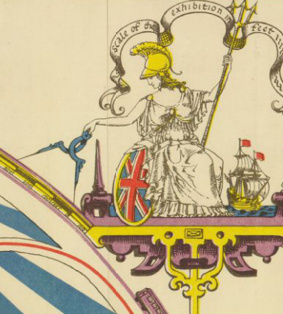 The scale bar is curved and is adorned by the Roman Britannia, looking down from her usual position and using a set of callipers to measure the distance in feet. The key is called “The Explanation” and includes such detail as denoting a Fire Station, Cinema and “Bermuda”. Various classic-looking cars, trams and double-decker buses rush around the outside of the map. Giant fish swim down a river near Kilburn. The more you look, the more you discover! On the main tube map section at the bottom, various now-closed stations are present – Broad Street, Victoria Park, Walham Green to name but three. 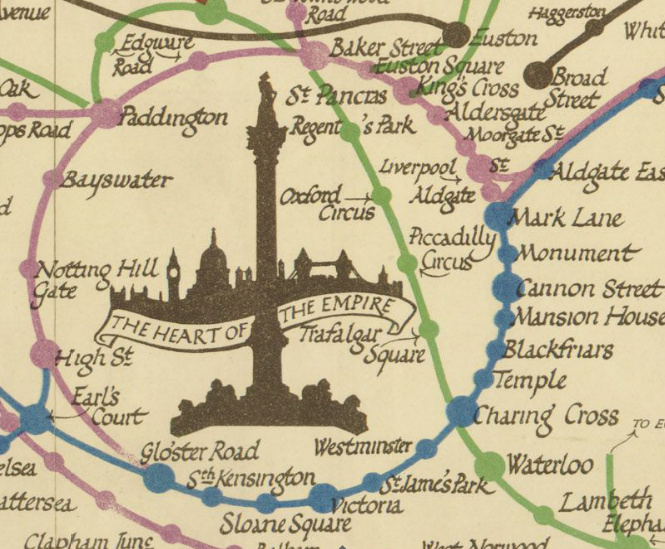 A silhouette of Nelson’s Column acts as the centre of the network map, with a further relief of 1920s London behind. Many of the buildings on the exhibition part of the map represent various countries that were part of the British Empire. The sizes vary hugely – the Australia building being the largest country-specific building. East Africa seems to get particularly short-changed, being a just small building between Nigeria and Malta. It is perhaps worth comparing this historic map with the one for the most recent “world exhibition” that London hosted, namely the 2012 Olympic Games. They don’t make maps like they used to! 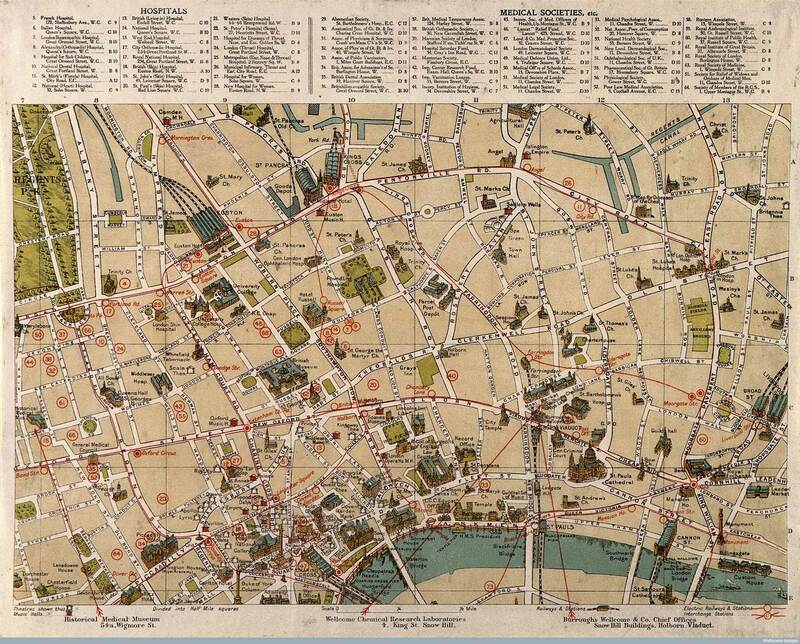 View the map at the British Library online gallery. There is also a larger, zoomable version. Hi I’ve found an old london tube map is quite big in my attic, I no its pre 1980s as it has the poplar to beckton under construction written on it .We didn’t no if it would be useful to anyone or if it’s worth anything . Hi Alison, yes I would imagine it is worth something, I am not an expert in old maps though, so I would recommend taking it to a dealer who is an expert in such things, such as The Map House in Knightsbridge.